This read-only area displays information about the objects to be deleted. This read-only area displays the full path to the active folder that contains the source files and folders to be deleted. If this option is checked, then the file is moved into Windows Recycle Bin (which you can use to recover the deleted files in case you need them later on, unless the Recycle Bin has been emptied, of course). 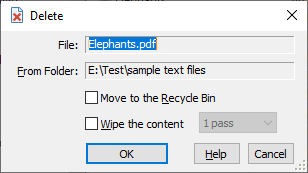 If this option is not selected, then the file is actually deleted, bypassing the Recycle Bin. Please be very careful when clearing this option, because if you delete a file without moving it to the Recycle Bin, it may be impossible to recover it! Keep in mind also, that Windows maintains the Recycle Bin on the hard drives only. If you delete a file from a removable or a mapped network drive, it will NOT be moved to the Recycle Bin even if you select this option! 3 passes Causes each file to be overwritten 3 times: The first time its content is replaced with the bit pattern 01010101 (0x55), the second time with the bit pattern 10101010 (0xAA), and the third time with the zero bytes (0x00). Note that this option takes approximately three times longer to complete than the 1-pass option. You may want to use the Wipe the content option to make it much more difficult to extract the contents of the files after they have been deleted. If you don't select this option, there is a possibility to reconstruct the original contents (or their parts) by using the undelete software utilities. Keep in mind, however, that as with most things, wiping the contents of the files is not an absolute guarantee of their complete destruction: it all depends on the specific implementation details of all components involved. For example, if you have enabled the NTFS compression for a file, then wiping it out may not achieve the desired effect, because when recording the bit patterns to the file, Windows may create a new compressed file from scratch rather than reuse the existing file. Or, most modern SSD drives may use the wear-leveling techniques that could prevent overwriting the existing data with the bit patterns. Remember that the only way to be absolutely sure that the files cannot be recovered, is to physically destroy the drive!